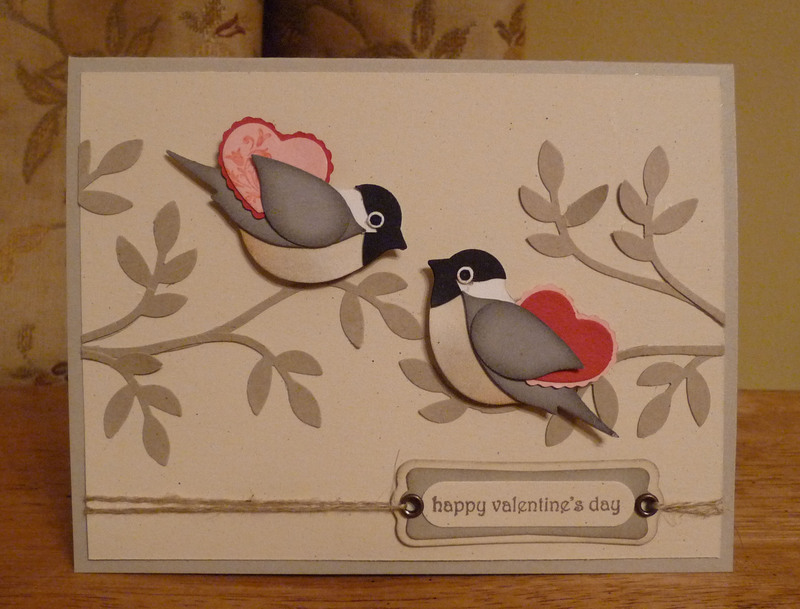 I wanted to make a more masculine version of my chickadee Valentine’s Day card, and to use the punch’s branch this time. I hesitated about using two hearts. It looked quite nice with just one bird giving, the other receiving, but in the end it was the math lesson I was giving to my son that day that made me tip this way. It was all about reciprocal numbers and fractions. How unromantic, I know, but that is how the name of this card, the reciprocal giving, and the reciprocal colored hearts worked their way into this project. Inspiration comes in many ways…even from math! But don’t these two look like they are really in love? Instructions for the card are right under the picture, but for instructions and supplies to make the birds, click on the chickadee in my sidebar. Tools and Accessories: Big Shot, Crop-a-dile, linen thread, antique brass metallic brads. The card is 4-1/4’’ x 5-1/2’’ (Sahara Sand), the mat is 4’’ x 5-1/4’’ (Naturals Ivory), and the branches are punched in Kraft card stock. Birds are mounted on card with dimensionals. Pink heart was stamped with one of the leafy images from the Tiny Tags in red. Greeting is stamped on Naturals Ivory in Chocolate Chip ink, then punched with Word Window punch. It is then layered on a Sahara Sand modern label, which is then layered over the coordinating Windows Movers & Shapers label in Naturals Ivory. Eyelets are set in with Crop-a-dile. This entry was posted in Punches on January 22, 2010 by Ann. Fabulous!!!! I love it and all of your punch art. Really great, and thank you for sharing. so sweet! love the little hearts tucked in to their wing! this is just too, too cute!! love it!